Saying exactly what needs to be said can be difficult when communicating through text messages. Many people use emojis for the moments that words cannot describe what needs to be said. The Unicode Consortium expects to release 230 new emojis for Apple users as early as September 2019, many of which are intended to accommodate or raise awareness for those with disabilities. Of the 230 new emojis offered in Unicode Emoji 12.0 are prosthetic arms, legs, emojis in wheelchairs, guide dogs, an ear with a hearing aid, and even an emoji signing the word “deaf” in American Sign Language. According to Dr. Daniel Blair, assistant professor of ASL and director for the Center of Deaf Studies at California Baptist University, the link between emojis and ASL is extremely close. “It’s visual, it’s symbols, it’s really sign language — all the emojis,” Blair said. With these emojis using signs from ASL, such as the “deaf person” emoji, that depicts an emoji signing the word deaf, Blair was curious as to how the deaf community would react to these emojis. At the California School for the Deaf in Riverside, people are generally welcoming of the update. Pearlene Utley, secretary at CSDR, said she is excited about the new emojis. “The more visibility (the deaf community) gets, the more awareness,” Utley said. Others, including Martha Harrision, an office technician at CSDR, raised some doubts about the acceptance of the emojis by the deaf community. The love-you gesture depicts the sign for love in ASL and the victory hand emoji depicts the letter V in ASL as well. 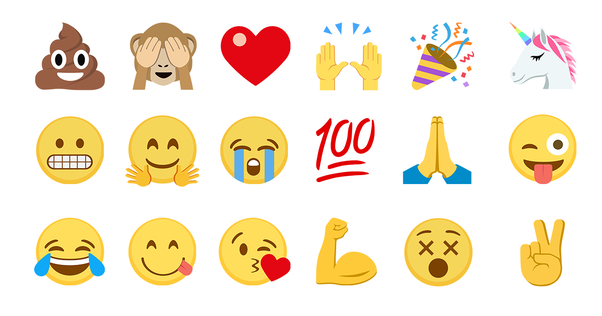 Only the future will tell how the deaf community uses and respond to the new emojis. For users to suggest future emojis, The Unicode Consortium supplies a proposal form on its website at Unicode.org/emoji/proposals.html.